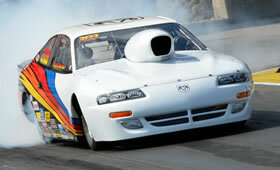 Brewer's Performance, Inc. has changed directions a few times since our beginnings in the Mopar muscle-car hobby in 1981. In the early years, we spent time locating good used sheet metal and optional equipment in Eastern and Southern salvage yards and parting out muscle cars we deemed "too rusty" to repair. Oh, for the chance to have some of those back! Our promotion efforts between 1981 and the early 1990s were primarily at the Spring and Fall Carlisle (PA) meets, the Mopar Nationals, and through Hemmings Motor News magazine. In the early 1990s we began adding some of the first reproduction parts available to the dwindling supply of original Mopar parts. Mopar-only shows sponsored by the new wave of Mopar car clubs were beginning to pop up at car dealerships, drag strips, and parks all over the eastern US. Some of the most well known were Northland Dodge in Columbus, RTS in Detroit, WPC at Motech, National Hemi Owner's Association (NHOA) meets, and Englishtown, NJ. 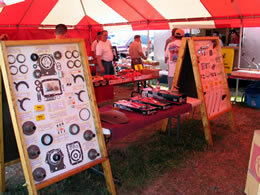 By 1995, Spring and Fall Carlisle had fallen by the wayside, and almost all of the shows we attended were Mopar-only. In the mid-1990s we zeroed in on specializing in 4-speed transmissions and related components. As our business grew during this time, the supply of original parts was rapidly being depleted. In 1995 we began reproducing clutch torque shafts and fiberglass floor tunnels for 4-speed conversions, and rebuilding A833 4-speed transmissions and Hurst shifter mechanisms. and our extensive inventory of Centerforce, Hays, and McLeod clutch kits, new and reconditioned flywheels, bellhousings, transmission rebuild kits, rebuilt OEM Hurst shifter mechanisms, speedometer cables and gears, restored clutch/brake pedal assemblies, new driveshaft assemblies, restored and reproduction pistol grip shifters, and many more. Our advertising is concentrated in the major Mopar oriented publications, including Mopar Collector's Guide, Mopar Muscle, and Mopar Action magazines. Keep in mind; the staff at Brewer's Performance -- Wayne, Dan, Rollie, Vickie and Lisa -- is here to serve YOU, our customer. Do not hesitate to contact us with any questions you might have!